Are you looking to learn more about cashmere moc turtleneck tops for women? A mock turtleneck is a collar that is lower than a turtleneck and is not turned over. Aneck for a knit garment similar to a turtleneck but shorter and without a fold. A turtleneck or turtleneck sweater is a sweater with a short round collar that fits closely around your neck. A turtleneck or turtleneck sweater is a sweater with a high neck which folds over. Cashmere wool, usually simply known as cashmere, is a fiber obtained from cashmere goats. Common usage defines the fiber as wool but is finer and softer, giving its characteristics as compared to sheep's wool. It provides warm, soft, and luxurious sweaters and other types of tops. Perfect candidate for a women's mock turtleneck sweater. 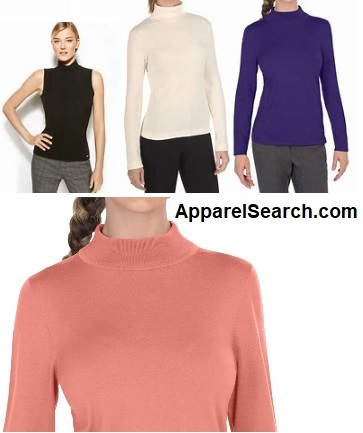 The mock turtle neck tops for women come in a wide variety of colors, styles and sizes. The neck style stays rather consistent but the rest of the top can vary widely. Stay warm and cozy in a women's cashmere mock turtleneck sweater. You may want to research the following ladies tops as well. By the way, mock turtlenecks can come on sleeveless, short, or long sleeve tops.